Category:Behavior Change,Climate Action,Climate Change,Green Infrastructure,Helen Santiago Fink,Resilient Cities,Water Tags : Puerto Rico Washington D.C.
Nature-based solutions are progressively gaining importance in the promotion of climate resiliency, ecological stewardship and climate action at the urban scale. In light of increasingly disruptive weather patterns and the associated social and economic impacts, local governments are starting to incorporate green infrastructure applications into policy, building codes, and development processes. The approach varies widely depending on local socio-economic conditions, institutional policies, technical capacity and leadership to mitigate climate hazards and advance resiliency. The use of Nature-based Solutions (NbS), green infrastructure as an example, is increasingly viewed as a climate adaptation measure to address stormwater, urban flooding and heat islands, though it is far from being mainstream. Yet NbS offer multi-functionality and should be incorporated into urban plans and strategies to bolster public health, air/water/soil quality, community well-being as well as to foster ecological stewardship to underpin climate action and sustainability. Greater emphasis on the latter could foster the behavior change necessary to move towards a greater social-ecological balance and mitigation of future climatic hazards (Santiago Fink 2016). This article, which is an excerpt of a research paper submitted for the Utrecht Earth System Governance Conference last November, outlines recent developments of nature-based solutions (NbS) at two locations driven by different rationales. Washington, DC has positioned itself as a leader in sustainability and with political commitment to the climate agenda through low-carbon investments and policy actions. The government already had a history of using green infrastructure as a means to address water quality and stormwater management concerns. The city subsequently embraced the concept of biophilia as defined in Timothy Beatley’s 2011 Book, Biophilic Cities, to foster human-nature connections and raise awareness of the rich biodiversity in the city. In Puerto Rico, NbS have remained largely garrisoned in academia and may finally have the opportunity to be introduced at scale as part of the disaster recovery process fueled by U.S. government reconstruction investment in the aftermath of the devastation of Hurricanes Irma and Maria. Washington, DC (WDC), initially employed the use of green infrastructure as a city-wide strategy to offset capital infrastructure investments to meet EPA compliance of the Clean Water Act as similarly was done by other USA cities. WDC strengthens its efforts over time incentivizing the use of green infrastructure to provide regulating ecosystem services to capture precipitation, manage stormwater and mitigate urban flooding. The city’s Stormwater Retention Trading Program aims to offset the city’s 43% of impervious land area by allowing real estate developers to generate and/or sell Stormwater Retention Credits (SRCs) to earn revenue for projects in exchange for employing green infrastructure applications. In 2016, WDC joined the global network of Biophilic Cities and started a process to optimize cultural ecosystem services in its pursuit of re-connecting people with nature to foster understanding of nature’s benefits and an appreciation of urban nature for enhancing human wellbeing (Beatley 2011). Cultivating environmental stewardship among residents is also an important goal to encourage behavior change towards supporting the District’s sustainability plan and the broader climate agenda. In cooperation with DC authorities, five working groups were established in early 2018, including Building Design and Landscape Architecture, Parks and Recreation, Citizen Science, Biodiversity and Wildlife, Food and Gardening. The working groups met periodically through September 2018, with the task of developing recommendations and models for integrating biophila into city operations and the urban fabric. I participated in the two workings groups further elaborated here. The Parks and Recreation Group developed a biophilic index consisting of five key categories: Natural Biophilic Park Elements, Biophilic Park Amenities, Biophilic Sensory Experience, Mental/Emotional Experience, and Biophilic Park Activity to be used in local design guidelines, educational programming and community engagement. The index will be promoted as a tool to be used by city staff as well as city residents to assess the quality of local parks and green spaces with the aim of fostering stewardship of their surrounding natural environments. A next step will be the identification of demonstration sites to implement the biophilic index (see Santiago Fink 2019). Under the Building Design and Landscape Architecture Working Group, numerous sites rich in biodiversity and natural design were assessed. Stakeholder discussions determined the city’s BID’s (Business Improvement Districts) to be potential valuable communicators of nature’s services through attractive landscaping, thematic competitions among property owners and informative signage. The replication of a successful local BID model will be tested in other municipal neighborhoods in the coming months. The interim outcomes of all the working groups were presented at the annual Biophilia Conference hosted by the University of the District of Columbia in October of 2018. The conference highlighted the need for equal access, incentives for developers and the importance of learning from good practices to mainstream nature-based solutions within the built environment, public spaces and infrastructure projects. Such government catalyzed efforts are essential to increase equity, scale and connectivity of NbS across the urban landscape (Steffen et al 2011). As the DC government considers future activities of the working groups, the more challenging goal of fostering stewardship for climate action will warrant greater community engagement and education to develop a broad stakeholder base across sectors using e-tools and social media among other means to scale social consciousness and foster appreciation and respect for the natural world. An aligned NbS initiative founded in WDC and now spreading across the USA is managed by ParkRx, a non-profit focused on promoting individual and public health by prescribing doses of nature as medical treatment for obesity, asthma, diabetes, depression among other conditions. ParkRx collaborates with local medical clinics and their physicians to take an integrative therapeutic approach to optimize the restorative health benefits ensued by the cultural ecosystem services of the surrounding natural world. ParkRx developed and manages an e-platform that maps the nearest park and green space to one’s vicinity and has received funding from the U.S. Forest Service to expand its health education activities. Research is needed to understand if and how health benefits derived from nature are a stronger driver for fostering stewardship than neighborhood beautification efforts, recognizing both are valuable for raising awareness, yet with the challenge to demonstrate their inter-connectivity to benefit individual wellbeing and urban quality of life. 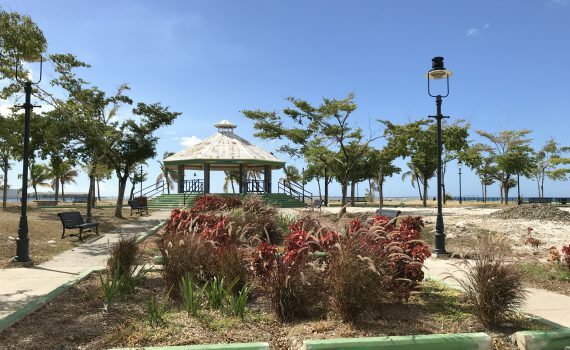 In Puerto Rico, NbS, better understood as green infrastructure, is a recognized concept among academics, research networks and select practitioners yet with very limited implementation. Existing practices are found as green walls for aesthetic purposes at hotels, pharmaceutical plants to treat waters and among certain environmental consulting groups able to secure grant funding. Municipalities have not made use of green infrastructure and resort to traditional grey infrastructure despite regular flooding with heighten intensity during hurricane season. In the aftermath of the 2017 hurricanes, the use of green infrastructure is being encouraged by U.S. Government agencies working on the Hurricane Maria recovery, especially the Environmental Protection Agency (EPA), National Oceanic and Atmospheric Association (NOAA), Federal Emergency Management Agency (FEMA) and Housing Urban Development (HUD). Municipalities are starting to consider green infrastructure for buildings and infrastructure projects with guidance of technical experts and new requirements for hazard mitigation, building codes, in an attempt to counter a history of building in flood zones and looking beyond business as usual practices focused on the use of grey infrastructure (and lots of concrete). Mitigating common hazards of coastal erosion are being explored through the lens of NbS given their regulating ecosystem services for wave and wind attenuation and strengthening local resiliency. Yet, large knowledge gaps exist among authorities and practitioners requiring a prioritization of information dissemination, trainings and capacity building workshops being organized across the island. Community planners are starting to work with municipal staff to identify priority re-development projects using GIS mapping tools with the aim to provide a more comprehensive and holistic perspective of the local topography and built environment, integrating layers of wetlands, road infrastructure, natural hazards among others. The maps are being elaborated in multiple phases with each step leading to greater detail of municipal projects, including senior and public housing, civic centers, infrastructure retrofits, tourism sites as well as residential relocation targets. As part of the redevelopment planning and recovery process, these mapping exercises can be used to introduce NbS to local authorities and Commonwealth institutions underscoring the multi-functionality of natural applications and vegetated spaces when integrated into the urban context. These efforts support the findings of the U.S. Forest Service Report documenting the significant loss of ecosystem services and tree canopy coverage on account of Maria and to promote the use of NbS to foster social, economic and ecological resiliency. Puerto Rico has a unique opportunity to rebuild its communities employing new practices and long-term view towards greater resiliency. This path forward will require a paradigm shift in government policymaking and investments at the Commonwealth spearhead by the upstream incentives of U.S. government disaster funding to create the enabling regulatory environment to allow municipalities and industry sectors to embrace new technologies and strengthen operational processes. Incorporating the use of green infrastructure within the infrastructure recovery projects can create new market opportunities as well as provide broader, valuable co-benefits for human health and wellbeing, environmental quality and community resiliency. These two contextually different trajectories demonstrate the challenges and opportunities of promoting the use of NbS as a means of connecting, communicating and catalyzing social-ecological sustainability (Chapin et al, 2010) throughout societies. More investigation and time is needed to understand the evolution and longevity of NbS in concept and practice at both locations. Will WDC’s biophilic process bring about the essential behavior change in transport, food and energy choices to create a low-carbon environment reinforcing societal climate action? Puerto Rico’s recovery process is just commencing and could last a decade. Will this time span cultivate a change in business as usual practices, where grey infrastructure is the norm and an appreciation for nature’s ecosystem services is weak, or will green infrastructure form part of state and local policies, operational budgets, plans and designs? Will optimizing the island’s rich biodiversity drive its resilient future and encourage decision-makers to embrace NbS as a productive recovery strategy for the present and future? Only nature will tell. Andersson, E., Barthel, S., Borgström, S., Colding, J., Elmqvist, T., Folke, C., Gren, Å., 2014. Reconnecting Cities to the Biosphere: Stewardship of Green Infrastructure and Urban Ecosystem Services. AMBIO 43 (4), 445–453. Chapin, F.S., Carpenter, S.R., Kofinas, G.P., Folke, C., Abel, N., Clark, W.C., et al., 2010. Ecosystem stewardship: sustainability strategies for a rapidly changing planet. Trends in Ecology and Evolution 25 (4), 241–249. Santiago Fink, H. (2019): Promoting Nature-based Solutions for Climate Resiliency: Evolving Trajectories of Washington, DC and Puerto Rico; conference paper for the Utrecht Earth System Governance Conference, Nov. 5 – 8, 2018. Steffen, W., Persson, Å., Deutsch, L., Zalasiewicz, J., Williams, M., Richardson, K., et al., 2011. The Anthropo-cene. From Global Change to Planetary Stewardship. AMBIO 40 (7), 739–761.